AFRICAN AMERICAN REPORTS: March for Black Women Draws Hundreds in Washington, D.C.
A few weeks before the 20th anniversary of the Million Woman March, hundreds of Black women mobilized in Washington, D.C. last Saturday for the March for Black Women. Saturday’s demonstration coincided with the March for Racial Justice. The intertwining of the two events was absolutely intentional, according to the executive director of Black Women’s Blue Print, Farah Tanis. “I said to myself that there will not be another March for Racial Injustice that does not truly center black women and their issues,” Tanis told the Washington Post. The organizers of the March for Black Women told the Post they wanted their demonstration to cater to women who felt left out of the Women’s March on Washington. Many women of color believed the January march was geared toward White feminism and felt excluded by the rally. “In this highly political moment of the 20th anniversary of the Million Woman March, the March for Black Women will amplify the struggles of Black women in the rural South—the “Black Belt,” and demand a cease and desist of all threats to those of us who are immigrant women across the country living in fear of deportation,” the rally’s statement continued. 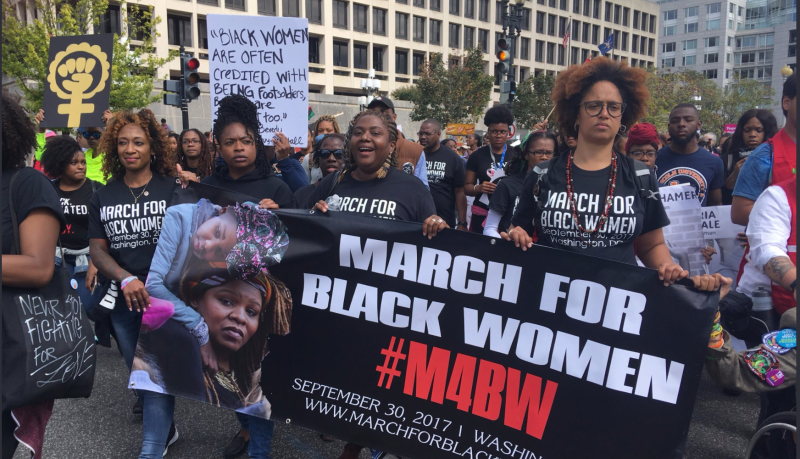 Read more March for Black Women Draws Hundreds in Washington, D.C.